Front row (from left): Grace Magnussen, Lauren Wolfe Lamb, Marie Ziegler, Shannon Williams Yancey, Tricia McNaughton Saunders, Afsoon Roshanzamir Johnston, Jennifer Ottiano Ferragatta. Back row: Sandra Bacher Fakaosi, Stephanie Murata, Kristy Schultz, Lisa Whitsett, Asia DeWeese, Cheryl Meyer Bergman, Jimi Dawn Hornbuckle and Andrea Carstens Yamamoto. Elena Pirozhkova remembers when she first showed up at the United States Olympic Training Center in Colorado Springs and met some of the first women to earn World medals for the United States. “I remember saying, ‘Who are these girls?’ when I saw Patricia Miranda and Sara McMann,” said Pirozhkova, a native of Russia who was raised in Greenfield, Mass. “I was so oblivious in my own little world when I was in high school. And that’s why U.S. national coach Terry Steiner felt it was important to bring 17 of the first competitors — dating back to the first FILA World Championships for women’s freestyle in 1989 — back for recognition for those in Las Vegas Convention Center on the second night of the ASICS U.S. Open in April during a reunion. But she said she and the other women are reluctant to be called pioneers for what they did a quarter of a century ago. “We just wanted to be called athletes and wrestlers,” said Saunders, who first wrestled as a club teammate of Zeke Jones in Michigan until age 13 when she was forced to give up the sport by high school officials until 10 years later when Jones first told her about the Worlds in 1989. And Saunders and many of the first women’s wrestlers were referred to something more than pioneers at a time when the anthem of the U.S. National Governing Body (NGB) was “we will not encourage the development of women’s wrestling in any way,” recalled Saunders. “I think most of us heard, ‘Why are you here? What is your social purpose?’ ” she added. “I think we are proud of the work that we did. If we could redo history and not deal with any of that other stuff, all of us would. I think it made us stronger and stick together. We were a team like any other team. 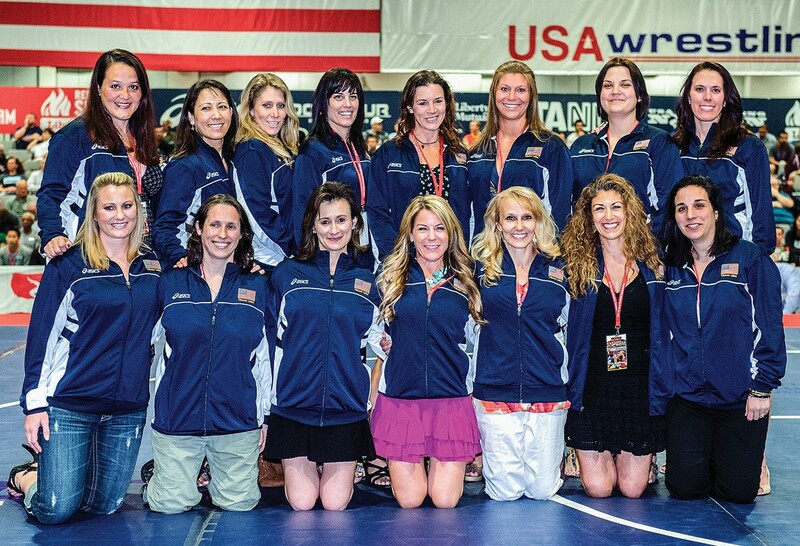 “What made me happy was that a lot of the women (in Las Vegas) never got a chance to see USA Wrestling evolve. All they know is that they funded all those World Teams, working for five bucks an hour some place to pay for a $500 plane ticket just to do a single exhibition. Saunders is married to former World Team men’s freestyle wrestler Townsend Saunders. They have three children. She said the early U.S. women grapplers did not feel like pioneers in the sport because many other women around the world were already wrestling. “The United States was behind (the rest of the world when it came to women’s wrestling),” she recalled. “We didn’t spearhead it. We were catching up and trying to get in the game that everyone else had started. “I was competing against those who had been competing their whole lives, especially in Japan where women had been practicing martial arts. We didn’t have the footing to know that we were not pioneers in the world. We were trying to bring the United States up to speed. We were trying to get on the train that was already moving. To add even more perspective to this women’s wrestling story, many of them could be mothers to those currently competing, including the likes of 158-pound U.S. Open champion Brittany Roberts, who was born one year after the first World Championships. “I didn’t realize how many pioneers there were and how long ago they competed, how long their legacy is,” said Roberts, who is currently coached at Oklahoma City University by Kristie Davis, a two-time World champion and nine-time medalist, who was not at the reunion.